The Grand Opening event for the first Tesla Gigafactory will be taking place on July 29 — at the facility location just outside of Reno, Nevada. The news comes to us following the receipt of email invitations sent to Tesla owners who took part in the company’s Referral Program and managed to sell 5 or more Model S sedans between November 1 and December 31, 2015. Those that received the invitation late Thursday evening quickly took to social media to share the exciting news with the rest of the Tesla community. Kushari one of the referral contest winners posted a short video highlighting the notice that he received from Tesla about the upcoming Gigafactory Grand Opening event. Earlier this year local media outlets in Reno, Nevada were given a rare chance to take a peek inside the Gigafactory. Motor Trend was also recently granted the rare opportunity to visit the $5 billion, but more importantly be one of the first media outlets allowed to spend time with and capture footage of the Model 3 prototype in action. 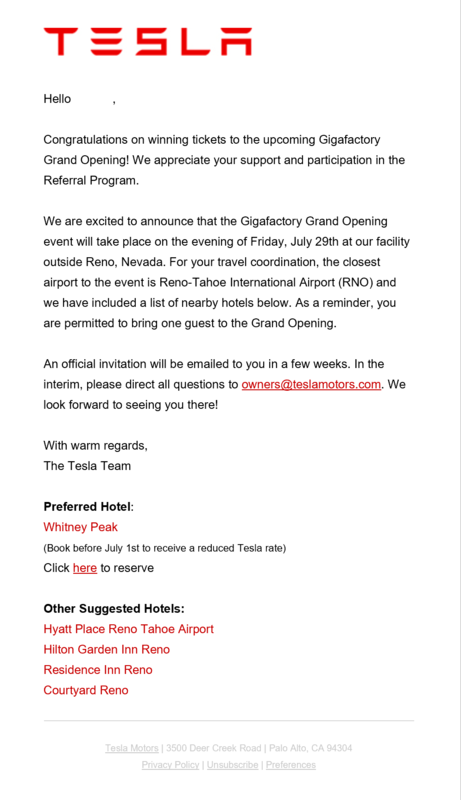 This upcoming invitation to the Gigafactory Grand Opening party on July 29 will be the first time Tesla opens it doors to the general public. Given the way that the Tesla Model 3 reveal ended up exceeding expectations ,I’m a bit curious how the Gigafactory event will go….